The Dirty Shirley - remember your childhood with this fun classic drink, all grown up. Add some cherry vodka to make the adult version of a Shirley Temple! Chocolate cherry truffles chock full of brownie decadence. Share them with your sweetheart tonight! Cherry cream pie in a jar - there's not much better. Single servings of complete and total win. Homemade cherry marshmallows are a welcome addition to any mug of hot cocoa or chocolate this holiday season. They're a real treat for the whole family. Chocolate cherry bread is special - fancy, even. 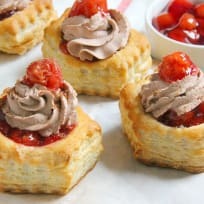 If you love chocolate covered cherries, this bread is for you! Cherry Pie Pancakes give you all the flavor of a classic pie favorite in a quick and pretty breakfast. Fluffy buttermilk pancakes with a hint of almond are loaded with sweet cherry pie filling and served with whipped cream! 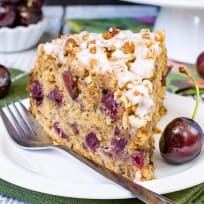 Black Forest coffee cake makes a pretty addition to your breakfast or brunch table, or a welcome companion for your afternoon coffee and tea. 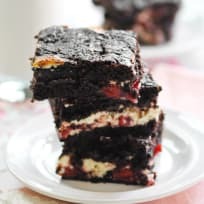 Moist, buttery coffee cake with gooey cherry pie filling and bits of rich dark chocolate in every bite. Roasted cherry toasts with honey nut cream cheese may seem like a decadent breakfast, but it’s super easy. 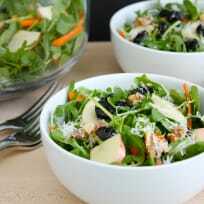 It’s also pretty enough to double as an appetizer! Cherry Greek yogurt parfaits are a sweet and simple way to start the day. And a great way to welcome Jocelyn to the Food Fanatic crew! Fresh Cherry Cola Floats are the perfect summer treat. Super easy, fresh cherry syrup is the star in these customizable ice cream floats. Healthy Homemade Granola Bars are really something special. Great for after school, after work, with a cup of tea, or post-run, these are snacks with staying power. Banana Splut Fudge is all the fun of the ice cream treat, in a bite-sized fudgey treat. A new twist on the summer classic!